There is no better time than now to think about your holiday marketing campaign if you don’t want to miss the biggest retail opportunity of the year! If the answer is NO then this guide is for you. The idea behind this guide is to get your website and conversion rates optimised through carefully planned campaigns and promotional ideas. This guide can also lend a hand with updating your merchandising strategy, thus attracting more holiday visitors and earning more on your total holiday revenue. Did you know an effective holiday marketing campaign can drive up to 40 percent more sales? Studies show that around 20 per cent of the total retail sales across the year happens during the holiday season, which means the holiday season accounts for more sales than Mother’s Day, Valentine’s Day, Father’s Day, Halloween, Easter and St. Patricks Day combined. According to the National Retail Federation, holiday sales during November and December 2017 increased by a whopping 5.5 per cent, exceeding the NRF’s prediction of between 3.6 and 4 per cent. This is the largest increase the market has seen since 2010, which marked a 5.2 per cent growth in sales. Based on the projections published by eMarketer, there is an expected 15.3 per cent hike in e-commerce and a 3.8 per cent increase in retail sales this year. What does this mean for you? If you work in sales, this holiday season is shaping up to be one of the most important ever. 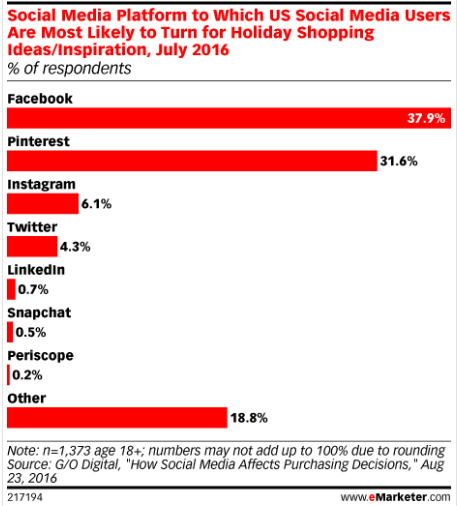 How influential is social media when it comes to holiday marketing? 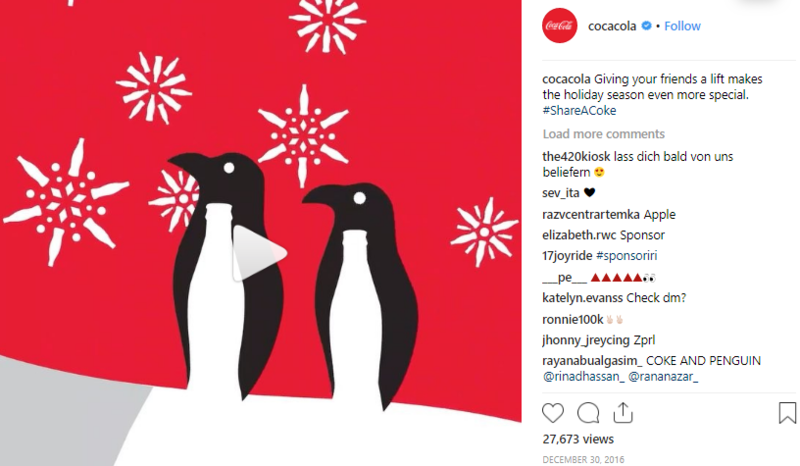 A 2016 study by eMarketer revealed that more than 50% of social media users are influenced by brands’ social media presence during the holiday season. Holiday shopping is no longer a ‘test of endurance’, where your potential customer has to go from mall to mall looking for the best offers. These days, it’s often the by-product of those special moments that a brand creates for their audience in social media. However, with the advent of smartphones, each user gets to experience hundreds of such micro-moments day and night. So, it is important that your band captures the attention of the right potential customers to win sales this holiday season. How can I make my social media festive and merry this holidays? It is common to decorate a physical store around the holidays to bring customers (and joy) to your business. Adopting the same approach for your social media holiday marketing plan makes perfect sense. Update your logo, social media profile image and cover image to match the festivity. You can even use your cover image to highlight your exciting offers for the season. 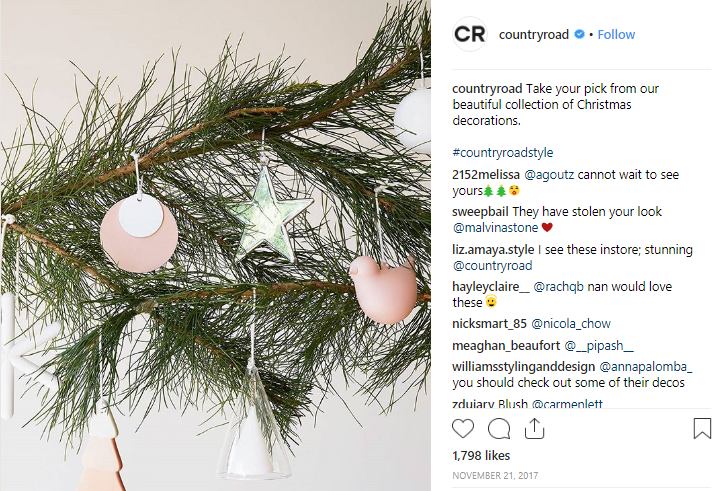 Australian retailer Country Road shared the Christmas spirit by featuring their Christmas decor. Try to mix the seasonal spirit with the personality of your brand and you’ll be good to go. 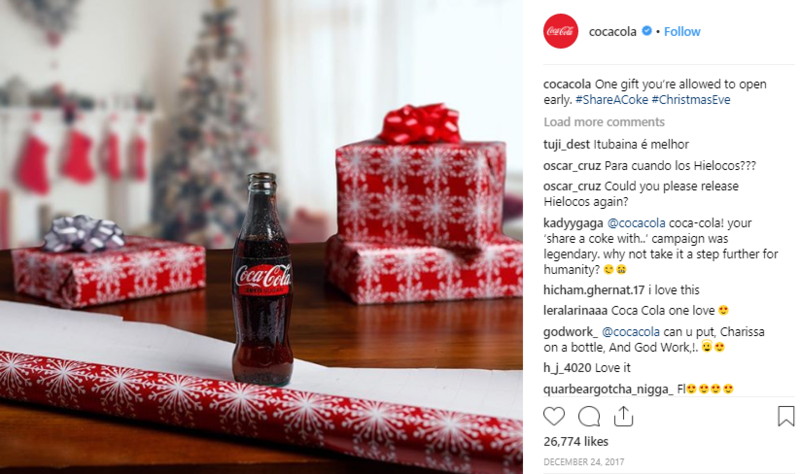 Placing popular festive hashtags (#christmasshopping, #wishlist2018) along with your holiday marketing posts will help you to reach more potential customers on Instagram and Twitter. Make sure you experiment with a mixture of low & high volume keywords for maximum exposure. Scheduling posts for when your target audience are most active is another great way to compete for organic hashtag exposure. You can also create relevant and specific campaign hashtags to keep track of user-generated content & connect more organically with your target audience. Accentuate your designs with snowflakes, bows or Santa Claus’ sleigh. Make sure your designs are hemisphere appropriate though! Who doesn’t like to be surprised, especially around the holiday season? Offers are like gifts for your customers. Create special offers/gift hampers pertaining to the holiday season and share them on your social media to bring in some seasonal cheer. Make it even more exciting by making the offer for a limited time period or quantity. If you’re looking for repeat customers, run a series of campaigns on your page, monitoring closely which kinds of offers have the highest uptake rates. Remember to create short snippets of any activities behind-the-scenes and make your audience a part of the entire process by sharing it as your Instagram story. You don’t have to talk about your brand all the time and bore your customers. You don’t want them to leave or mute your posts! Instead, you can choose to be social on your social media pages. Interact with your followers. Why not conduct an Instagram poll to ask them questions like what’s the best holiday season movie or their most embarrassing Christmas day gift? Include them in conversations about the Holiday season tips, Christmas cracker jokes, recipes and so on. Holidays are the perfect time to highlight any social cause your business is involved in (or if you don’t have a cause you support, consider finding one). Choose a cause that your followers can relate to and that makes sense to your employees as well. Share it across your social media platforms with relevant hashtags. 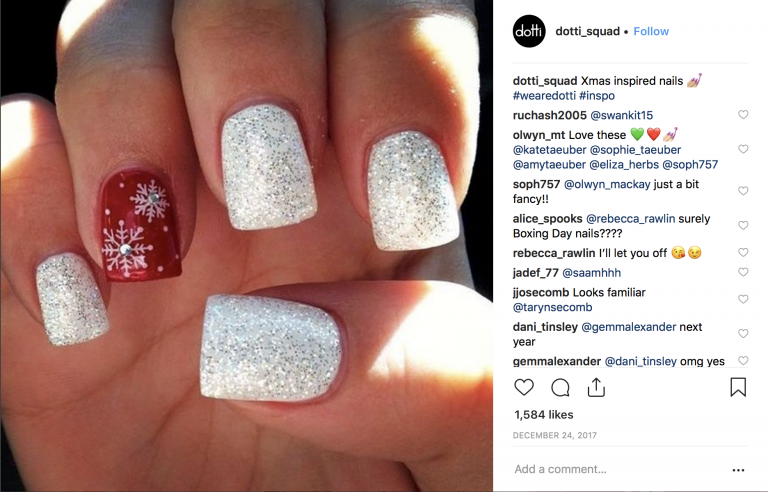 If the aim of your holiday marketing campaign on social media is to direct traffic to your website, then it’s best to decorate your landing pages with visuals to get your visitors in the holiday mood. You can also use dedicated landing pages to retarget audiences that visit through specific social media or online ads. 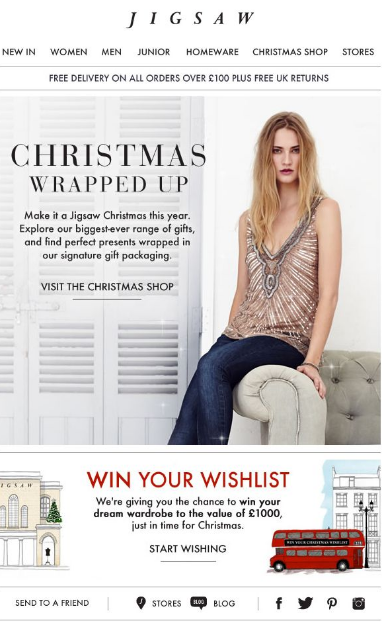 Sending a personalised holiday campaign email newsletter is a great way to engage potential customers. In fact, we find customers do expect the best deals to go directly to their inbox! Before you start with the newsletter make sure you have your goals clearly defined & create call-to-action buttons accordingly. Make sure you add the social media buttons to your newsletter to earn some additional followers. 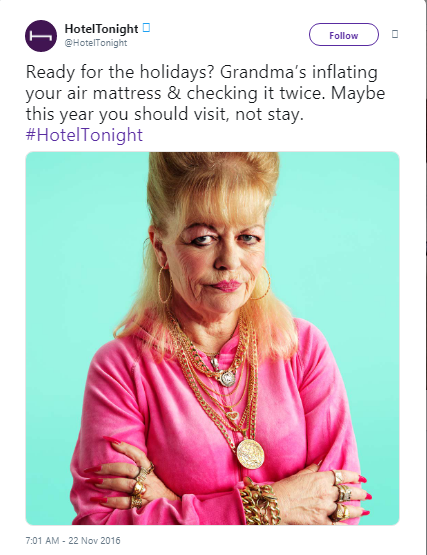 Holiday marketing campaigns are different from other marketing campaigns especially because of the element of fun involved. Plan an amazing holiday marketing plan for your brand, but don’t let the stress get to you. Whenever you feel like losing it, laugh out loud and be merry!